It's a hot trend, and I want to try to make it myself (of coarse). I think it would be nice to choose the shapes and stuff I want. There are already instruction out there on how to do it. Using a sharpie seems like the main way, BUT how many other ways can it be done? It was a bit of a failed attempt, but so fun. Using different pressures, gave a slightly changed image. 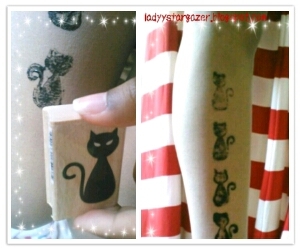 I'm going to try another way of making tattoo stockings next week. This time no black, and a sweet theme : ). What an awesome idea!I gotta try this!